Wang, J, et al. Overcoming Chemotherapy Resistance by Targeting the Insulin-like Growth Factor 1 (IGF-1) Axis in a Patient with Metastatic Castration- Resistant Prostate Cancer and Pituitary Adenoma: Killing Two Birds with One Stone. (2017) J Clin Trials Pathol Case Stud 2(2): 70- 74. Background: Prostate cancer is the most commonly diagnosed cancer in men. Currently, no durable cure exists for advanced metastatic castration-resistant prostate cancer, and only limited therapeutic success has been achieved in terms of improved overall survival. We report a case of prostate cancer with underlying acromegaly tremendously respond to the somatostatin analogs. Case presentation: In a 63-year-old male with metastatic prostate cancer who had progressed through multiple lines of therapies, a previous unrecognized growth hormone producing pituitary adenoma was diagnosed after a clinical observation of acromegaly at the time of consultation. We hypothesized that up-regulation of the insulin-like growth factor-I (IGF-1) axis was involved in the progression and drug resistance of our patient’s prostate cancer. 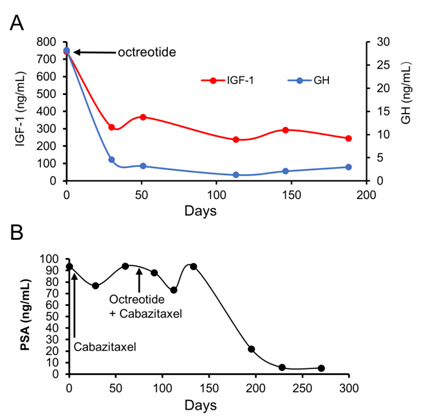 Given the anti-apoptotic properties of IGF-1, we reasoned that the efficacy of cytotoxic chemotherapeutic agents may be enhanced by co-administration of agents that inhibit IGF-1 bio-activity. Clinical partial response was achieved following the addition of Sandostatin® LAR to the hormone treatment and cabazitaxel, in addition, laboratory studies showed normalization of persistently elevated serum GH and IGF-1 concentrations and significant decrease in level of Prostate-specific antigen. Conclusion: Our results suggest that upregulation of IGF signaling, may confer androgen independence and chemoresistance. Concomitant administration of octreotide may overcome the clinical resistance to these therapies and improve the clinical outcome in patient with metastatic prostate cancer. We reviewed the published evidences of IGF-1 in promoting disease aggressiveness and chemotherapy resistance in refractory prostate cancer and the clinical benefit of targeting the IGF-1 axis with a somatostatin analogue. Prostate cancer is the most commonly diagnosed male cancer and is the third leading cause of cancer-related deaths in men. Approximately 161,360 American men will be diagnosed with prostate cancer this year, and more than 26,730 can expect to die from their disease. In advanced prostate cancer, androgen deprivation therapy (ADT) is considered first-line treatment; however, progression to androgen independence, also known as metastatic castration-resistant prostate cancer (mCRPC), tends to occur 12 - 24 months after beginning ADT[3,4]. In such cases, treatment with cytotoxic chemotherapy, such as docetaxel and cabazitaxel, or novel anti-androgens, including enzalutamide and abiraterone, is warranted. Unfortunately, up to one-third of patients receiving abiraterone, and one-fourth of patients receiving enzalutamide are resistant to these therapies up-front, and all patients eventually develop some level of resistance to treatment. Because of the cross resistance between anti-androgen therapies, cytotoxic chemotherapy remains an effective treatment option for men with mCRPC. Docetaxel has been shown to confer a survival advantage[6,7], and cabazitaxel may retain its effectiveness even after patients develop resistance to docetaxel. The development of resistance to anti-cancer therapies nevertheless remains a major hurdle in the effort to induce long-lasting clinical responses in patients with mCRPC, and there currently is no durable cure for mCRPC. Harnessing an understanding of the mechanisms driving treatment resistance can facilitate the development of new therapies and better patient outcomes. One proposed mechanism for drug resistance involves insulin-like growth factor (IGF). The IGF family, consisting of two ligands (IGF-1 and IGF-2), two receptors (IGF-1R and IGF-2R), and six binding proteins (IGFBP 1-6), plays a physiologic role in cellular proliferation, differentiation, apoptosis, transformation and metabolism[8,9]. Secretion of IGF-1 by the liver and other organs is regulated by growth hormone (GH), which is secreted by the pituitary gland. Recent studies have suggested that IGFs are involved in the biology of prostate cancer[9,10], and accumulated evidences support that IGF signaling is critical in the development of prostate cancer bone metastases, angiogenesis, and progression to androgen independence[8-10]. Additionally, prostate specific antigen (PSA) has been recognized as a protease that hydrolyzes IGFBPs, subsequently increasing the bioavailability of IGF, which in turn propagates disease progression. Because IGF-1 secretion is controlled by GH, this axis can be regulated by somatostatin and its analogs[9,11]. Somatostatin analogues as an adjunct to chemotherapy for CRPC has been proposed, as these agents appear to work in synergy with taxanes to inhibit the action of anti-apoptotic proteins such as the Bcl-2 family of proteins. Several studies have evaluated the impact of somatostatin analogues on tumor cell viability and clinical outcomes (Table 1). We report a heavily pretreated prostate cancer and incidental finding of pituitary adenoma, which progressed through multiple lines of therapies. His course of therapy notable for a very short the duration of response to each treatment he received, including conventional ADT(Casodex, Lupron), cytotoxic chemotherapy (docetaxel, Cabazitaxel) and novel androgen signaling inhibitors (abiraterone and enzalutamide). Upon the diagnosis of a previous unrecognized growth hormone producing pituitary adenoma, somatostatin analogue Sandostatin LAR was started, which led to normalization of growth hormone (GH) and insulin-like growth factor-I (IGF-I) concentrations and near complete response of his lymphadenopathy. Table 1: Pre-clinical and clinical studies evaluating the synergistic biological activity of somatostatin analogues and cancer therapy. In September 10, 2015, a 63-year-old male with history of metastatic prostate cancer came to our institution for consultation. He was initially seen by primary care physician for gross hematuria. His prostate cancer diagnosed by transrectal ultrasound biopsy of prostate in November 2013. Serum prostate-specific antigen (PSA) level at that time was 96 ng/mL. A computed tomography (CT) scan showed retroperitoneal lymphadenopathy, abnormal prostate gland. Magnetic resonance imaging (MRI) showed prostate cancer at the right posterior aspect of the peripheral zone with extra capsular extension and right seminal vesicle invasion with the clinical stage cT3bN0M1. A transrectal ultrasound biopsy of prostate showed adenocarcinoma with Gleason scores of 6 (3 + 3), 7(3 + 4), 8(3 + 5), 8(5 + 3); biopsy of left pelvic node biopsy prostatic adenocarcinoma with a Gleason score 5 + 5. He was initially treated with Casodex 50 mg orally daily and Lupron 22.5 mg depot intramuscular injection once every 3 months at outside hospital. His PSA nadir was 0.6 ng/mL in March, 2014. Unfortunately, his PSA started to rise. On June 19, 2014, his PSA increased up to 11.1 ng/mL, and then on 9/10/2014, PSA went up to 97.5 ng/mL. A CT scan showed increase adenopathy, hydronephrosis. Subsequently his disease had progressed through multiple lines of therapies, including docetaxel, abiraterone acetate in combination with prednisone, and then, enzalutamide. Considering his rapid progressive disease, the patient was thus started on cabazitaxel 25 mg/m² every 3 weeks with 10 mg of daily prednisone. He initially had a good biochemical response with decreasing PSA, but disease progressed after cycle 3 of therapy. At the time of consultation, the most notable on our patient’s physical examination were features of acromegaly. He exhibited coarsening of facial features, frontal bossing, macroglossia, enlargement of the lower lip and nose, and enlargement of extremities. He denied any headaches or visual field defects. A positron emission tomography (PET) scan revealed diffuse fluorodeoxyglucose (FDG)-avid adenopathy in the left cervical, left supraclavicular and retroclavicular, mediastinal, abdomen, and pelvis regions (Figure 1A). In addition, PET-CT scan showed increased FDG-avidity in the prostate (Figure 1A) and pituitary gland. Similar findings were seen on a pre-treatment computerized tomography (CT) scan (Figure 1B). A magnetic resonance imaging (MRI) of the brain confirmed a non-enhancing T2 hypo-intense pituitary mass (Figure 1C). Laboratory studies revealed elevated growth hormone 28.20 ng/mL (normal range [NR]: 0 - 6 ng/mL), IGF-1745 ng/mL (NR: 60 - 220 ng/mL) and IGFBP-3 6,380 ng/mL (NR: 2592 - 4770 ng/mL). These findings were consistent with a GH-producing pituitary adenoma. Figure 1: (A) Computerized Tomography (CT) showing enlarged left cervical lymph node (red circle) before octreotide treatment. (B) Positron Emission Tomography (PET) scan showing an enlarged prostate with increased fluorodeoxyglucose (FDG)-avidity prior to treatment. (C)Magnetic resonance imaging (MRI) of the brain showing a non-enhancing T2 hypo-intense pituitary mass. (D) PET-CT scan after two months of chemotherapy plus octreotide shows decreased prostate FDG-avidity,compared with prior to treatment. (E) PET-CT scan after seven months of chemotherapy plus octreotide shows further decrease in the FDG-avidity of the prostate, compared with prior to combination therapy. (F) CT scan after seven months of chemotherapy plus octreotide shows significant decrease in size of the left cervical metastatic adenopathy. In reviewing this unusual case of prostate cancer patient who had very short durations of response to both ADT and chemotherapy, we hypothesized that up-regulation of the IGF-1 axis may be involved in the progression and drug resistance of our patient’s prostate cancer, and, given the anti-apoptotic properties of IGF-1, and we reasoned that the efficacy of cytotoxic chemotherapeutic agents may be enhanced by co-administration of agents that inhibit IGF-1 bio-activity. After an informed consent, our patient was started on octreotide (Sandostatin®) 20 mg, IM, every 4 weeks. Sandostatin LAR was very well tolerated and patient did not experience any toxicity. A PET scan performed at 2 and 7 months after the addition of octreotide to cabazitaxel chemotherapy demonstrated continued decrease in the FDG-avidity of the prostate (Figures 1D and 1E), and a dedicated CT scan of the neck/chest showed significant decrease in the left cervical adenopathy (Figure 1F). Post-treatment laboratory studies showed that the addition of octreotide to chemotherapy led to normalization of serum levels of GH (89.4% reduction) and significant decreased levels of IGF-1 (67.1%), IGFBP-3 (19.1%), and PSA (94.4% reduction) (Figures 2A and 2B). Figure 2: (A) Serum levels of growth hormone (GH) and insulin-like growth factor 1 (IGF-1), after addition of octreotide. (B) Serum levels of Prostate-specific antigen (PSA). Octreotide was added to cabazitaxel treatment on day 85. Prostate cancer is estimated to cause approximately 26,730 deaths in 2017. When distant metastases from prostate cancer are present, the 5-year relative survival rate is only 29%. Androgen-deprivation therapy is the standard of care for these patients; however, when tumors eventually become castration resistant, additional therapeutic interventions are required. The role of insulin-like growth factor-1 (IGF-1) in prostate cancer invasion and progression has been well described[8-10,13], and IGF-1 has been shown consistently to be an important factor in cancer development in both in vitro and in vivo studies[8,10]. A prospective study identified a strong correlation between IGF-1levels and prostate cancer risk, wherehigher plasma IGF-1 levels were associated with an increased incidence of prostate cancer. Additionally, it has been shown that increased expression of IGF-1R is associated with the conversion of androgen-sensitive tumors to androgen-independent tumors. Suppression of type 1 IGF receptor (IGF-1R) expression by antisense RNA inhibits prostatic cancer invasion and progression. Acromegaly is commonly caused by GH-secreting pituitary adenomas. The question of whether acromegaly predisposes patients to prostate cancer through IGF-1 axis signaling remains unresolved and the evidence is circumstantial[15,16]. It is known, however, the prostate cancer concurrent with untreated acromegaly is likely to be more aggressive. Uncontrolled GH secretion may spur the growth of the cancer and increase morbidity and mortality. Somatostatin and analogues are reported to inhibit proliferation, induce apoptosis and inhibit tumor angiogenesis[17,18]. Somatostatin analogues, therefore, might be utilized to treat acromegaly while also potentially dampening down the prostate cancer process through a variety of mechanisms. It has been shown that somatostatin analogues can decrease the burden of prostate cancer by either direct impact on tumor cells or through alteration of the peritumoral blood circulation. Octreotide (sandostatin long acting release) is a somatostatin analogue which decreases IGF-1 by reducing the growth hormone secretion from the pituitary gland. Octreotide significantly lowers IGF-1 in patients with non-metastatic CRPC. Somatostatin receptors (SSTRs) are overexpressed in prostate cancer and provide potential targets for the treatment of CRPC. Taxane derivatives, including docetaxel and cabazitaxel are approved as most active agents for the treatment of prostate cancer. Docetaxel inhibits microtubule disassembly and triggering cell death in dividing cells. However, the effectiveness of docetaxel is limited by its high affinity for P-glycoprotein, an ATP-dependent drug efflux pump that decreased the intracellular concentration of docetaxel. Cabazitaxel is a novel tubulin binding taxoid which has poor affinity for P-glycoprotein, ATP dependent drug efflux pump, thus enhancing antimitotic activity.Cabazitaxel was shown to be active in acquired docetaxel resistance. Lo Nigro et al., indicates somatostatin analogue combination with docetaxel help to overcome the drug resistance in PC-3R (docetaxel-resistant PC-3) cell line. Combination treatment with docetaxel and octreotide results in significant synergistic cytotoxic effect in human hormone-refractory prostate cancer cells by direct inhibition cell proliferation and secretion of growth factors. This strong synergism also enables to lower the dose of docetaxel, side effects, and delay the resistance development. Our case suggests that GH-dependent IGF-1 production (via a concomitant pituitary tumor) has the ability to protect tumor cells from apoptosis, thereby promoting cancer progression despite androgen suppression and cytotoxic chemotherapy. 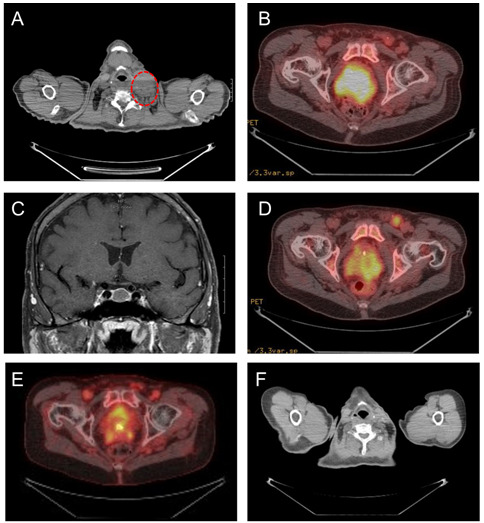 Co-administration of an anti-IGF-1 agent with chemotherapy, led to a dramatic response in both the acromegaly and prostate cancer, with improvement in the clinical, radiographic, and biochemical abnormalities associated with each disease. This case demonstrates that elevated IGF-1 due to a pituitary adenoma in a patient with mCRPC likely contributed to the aggressiveness of his disease as well as the development of chemotherapy resistance. Re-sensitization to chemotherapy was observed when a somatostatin analogue was co-administered, suggesting that targeting the IGF-1 axis may be integral in developing new therapeutic options for patients with mCRPC. These findings provide an opportunity to study the biological basis for the relationship between IGF-1 levels and progression of androgen-independent and chemotherapy- resistant prostate cancer. These observations, though not definitive, are highly encouraging and deserve further investigations in prospective clinical trials. 1. Siegel, R.L., Miller K.D., Jemal, A. Cancer Statistics, 2017. (2017) CA Cancer J Clin 67(1): 7-30. 2. National Comprehensive Cancer Network. National Comprehensive Cancer Network. Prostate Cancer (Version 1.2017). 3. Armstrong, C.M., Gao, A.C. Drug resistance in castration resistant prostate cancer: resistance mechanisms and emerging treatment strategies. (2015) Am J Clin Exp Urol 3(2): 64-76. 4. Zhu, S., Oremo, J.A., Li, S., et al. Synergistic antitumor activities of docetaxel and octreotide associated with apoptotic-upregulation in castration-resistant prostate cancer. (2014) PLoS One 9(3): e91817. 5. Teply, B.A., Hauke, R.J. Chemotherapy options in castration-resistant prostate cancer. (2016) Indian J Urol 32(4): 262-270. 6. Tannock, I. F., de Wit, R., Berry, W.R., et al. Docetaxel plus prednisone or mitoxantrone plus prednisone for advanced prostate cancer. (2004) N Engl J Med 35(15): 1502-1512. 7. Petrylak, D.P., Tangen, C.M., Hussain, M.H., et al. Docetaxel and estramustine compared with mitoxantrone and prednisone for advanced refractory prostate cancer. (2004) N Engl J Med 351(15): 1513-1520. 8. Denduluri, S.K., Idowu, O., Wang, Z., et al. Insulin-like growth factor (IGF) signaling in tumorigenesis and the development of cancer drug resistance. (2015) Genes Dis 2(1): 13-25. 9. Gennigens, C., Menetrier-Caux, C., Droz, J.P. Insulin-Like Growth Factor (IGF) family and prostate cancer. (2006) Crit Rev Oncol Hematol 58(2): 124-145. 10. Nickerson, T., Chang, F., Lorimer, D., et al. In vivo progression of LAPC-9 and LNCaP prostate cancer models to androgen independence is associated with increased expression of insulin-like growth factor I (IGF-I) and IGF-I receptor (IGF-IR). (2001) Cancer Res 61(16): 6276-6280. 11. Dalezis, P., Geromichalos, G.D., Trafalis, D.T., et al. Dexamethasone plus octreotide regimen increases anticancer effects of docetaxel on TRAMP-C1 prostate cancer model. (2012) In Vivo 26(1): 75-86. 12. Karaca, B., Degirmenci, M., Ozveren, A., et al. Docetaxel in combination with octreotide shows synergistic apoptotic effect by increasing SSTR2 and SSTR5 expression levels in prostate and breast cancer cell lines. (2015) Cancer Chemother Pharmacol 75(6): 1273-1280. 13. Chan, J.M., Stampfer, M.J., Giovannucci, E., et al. Plasma insulin-like growth factor-I and prostate cancer risk: a prospective study. (1998) Science 279(5350): 563-566. 14. Burfeind, P., Chernicky, C.L., Rininsland, F., et al. Antisense RNA to the type I insulin-like growth factor receptor suppresses tumor growth and prevents invasion by rat prostate cancer cells in vivo. (1996) Proc Natl Acad Sci U S A 93(14): 7263-7268. 15. Webb, S.M., Casanueva, F., Wass, J.A. Oncological complications of excess GH in acromegaly. (2002) Pituitary 5(1): 21-25. 16. Melmed, S. Acromegaly and cancer: not a problem? (2001) J Clin Endocrinol Metab 86(7): 2929-2934. 17. Hejna, M., Schmidinger, M., Raderer, M. The clinical role of somatostatin analogues as antineoplastic agents: much ado about nothing? (2002) Ann Oncol 13(5): 653-668. 18. Liu, Z., Bengtsson, S., Krogh, M., et al. Somatostatin effects on the proteome of the LNCaP cell-line. (2007) Int J Oncol 30(5): 1173-1179. 19. Reubi, J. C., Schaer, J. C., Laissue, J. A, et al. Somatostatin receptors and their subtypes in human tumors and in peritumoral vessels. (1996) Metabolism 45(8 Suppl 1): 39-41. 20. Friedlander, T.W, Weinberg, V.K, Small, E.J., et al. Effect of the somatostatin analog octreotide acetate on circulating insulin-like growth factor-1 and related peptides in patients with non-metastatic castration-resistant prostate cancer: results of a phase II study. (2012) Urol Oncol 30(4): 408-414. 21. Kavallaris, M. Microtubules and resistance to tubulin-binding agents. (2010) Nat Rev Cancer 10(3): 194-204. 22. Bradshaw, D.M., Arceci, R.J. Clinical relevance of transmembrane drug efflux as a mechanism of multidrug resistance. (1998) J Clin Oncol 16(11): 3674-3690. 23. Attard, G., Greystoke, A., Kaye, S., De Bono, J. Update on tubulin-binding agents. (2006) Pathol Biol (Paris) 54(2): 72-84. 24. Lo Nigro, C., Maffi, M., Fischel, J.L., et al. The combination of docetaxel and the somatostatin analogue lanreotide on androgen-independent docetaxel-resistant prostate cancer: experimental data. (2008) BJU Int 102(5): 622-627. 25. Erten, C., Karaca, B., Kucukzeybek, Y., et al. Regulation of growth factors in hormone- and drug-resistant prostate cancer cells by synergistic combination of docetaxel and octreotide. (2009) BJU Int 104(1): 107-114. 26. Tang, X., Takekoshi, S., Ito, J., et al. Somatostatin analogue inhibits the mobility of prostate carcinoma cells: a new therapeutic method for advanced prostate carcinoma. (2010) Int J Oncol 37(5): 1077-1083. 27. Koutsilieris, M., Mitsiades, C.S., Bogdanos, J., et al. Combination of somatostatin analog, dexamethasone, and standard androgen ablation therapy in stage D3 prostate cancer patients with bone metastases. (2004) Clin Cancer Res 10(13): 4398-4405. 28. Zarogoulidis, K., Eleftheriadou, E., Kontakiotis, T., et al. Long acting somatostatin analogues in combination to antineoplastic agents in the treatment of small cell lung cancer patients. (2012) Lung Cancer 76(1): 84-88.